The Northern Utah Youth Symphony and Chamber Orchestra will present their mid-winter showcase concert Saturday February 23, 2019, at Logan High School. The concert time is 5:00 pm with free admission thanks to our season sponsors. The Northern Utah Youth Chamber Orchestra, Nathan West conducting, will open the concert with arrangements of Grieg's Prelude to the Holberg Suite, Saint-Saens' Theme from Havanaise, Schubert's first movement of the Unfinished Symphony. The Northern Utah Youth Symphony, Conrad Dunn conducting, will then take the stage. 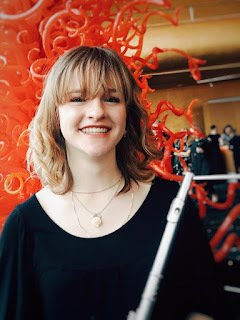 They will begin one their concerto audition winners, Allison Cook, Flute, performing the first movement of the Quantz Flute Concerto in G. Then the full orchestra will take the stage with "Movie Spectacular" featuring music from Batman, Dances With Wolves, and Robin Hood, Prince of Thieves. The concert will conclude with Tchaikovsky's 1812 Overture. There will be no cannons at this performance due to the indoor venue. The youth orchestras are a project of the Lake Bonneville Symphonic Society, with the help of our season sponsors, Classical Strings of Harrisville, PetsFirst! Wellness Center of Brigham City, BrainTrainUT of South Ogden & Logan, Edge Orthodontics of Brigham City, and Cache Valley Endocrine & Diabetes Center. Our funding also includes the George S and Dolores Dore Eccles Foundation, and the Utah Arts & Museums with funding from the National Endowment for the Arts. Allison Cook, a senior at Mountain Crest High School, loves animals, camping, music, and hanging out with friends. She has studied the flute for eleven years, under both Rebecca Fuller and Cindy Henderson. She has received many awards and recognitions performing with her flute including Superior rating at the National Federation of Music Clubs' competition, 2nd place at the 2017 Young Artists' Cup, as well as the 2017 Cache Valley South Town's Got Talent Show. She was also the winner of the talent section of the 2018 Cache Valley Distinguished Young Woman Pageant. Allison is currently in her second year with the Northern Utah Youth Symphony, and enjoys working with so many great young musicians! She is delighted to share her talents with so many people.